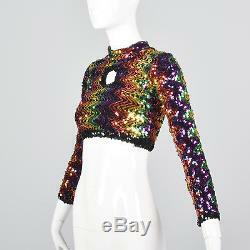 XS 1970s Black Knit Crop Top Rainbow Sequins Long Sleeves Disco Party 70s VTG. This listing is for one top. 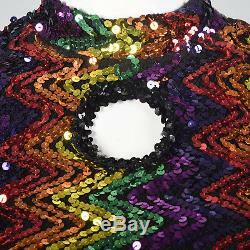 The textile is unmarked, black knit covered in rainbow sequins, and is medium weight. This top is unlined with a keyhole neckline, long sleeves, and an open back. There is velcro behind the neck to fasten this top. 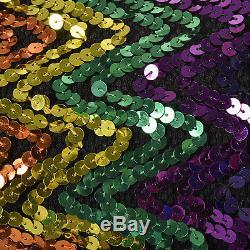 There is one area of missing sequins on the wearer's right side (under the arm), but this is normal with heavily sequined items. XXS - XS Please Check Measurements to be Sure! Cost is based on total weight. This does not apply to fragile items that may have to be packed separately. Non-returnable items will be noted as such. Any/all accessories, and packaging must be included and hang tags must be attached. Vintage items will have wear consistent with age, this is part of their charm and should be expected. Items may be larger or smaller than my mannequin or model and may be clipped or pinned to show fit. Accessories are not included unless otherwise stated. Deadstock or NOS- Vintage garment possibly in original packaging, never used. These items may have fading, staining or other issues from years of storage, visible flaws will be noted. Mint- Pristine as the day it was made, shows no signs of wear. Near Mint- Item shows only the slightest signs of wear. Excellent- Item shows typical signs of wear due to occasional use. Very Good- Item is wearable, but has some surface flaws such as fading or staining. 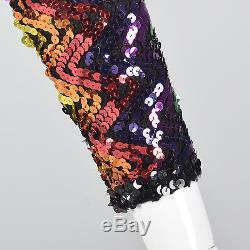 Fair- Item is barely wearable, could be used for a costume or as a project piece. 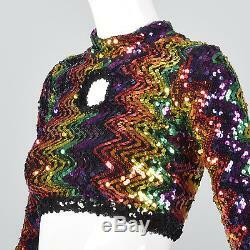 Poor- Item is not wearable and could only be used for repurposing or a pattern. 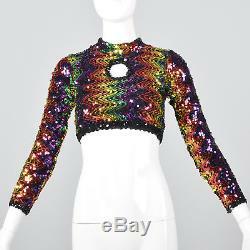 The item "XS 1970s Black Knit Crop Top Rainbow Sequins Long Sleeves Disco Party 70s VTG" is in sale since Tuesday, April 17, 2018. 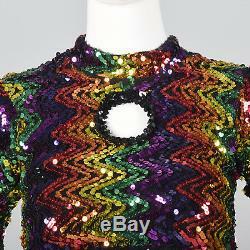 This item is in the category "Clothing, Shoes & Accessories\Vintage\Women's Vintage Clothing\Tops". The seller is "styleandsalvage" and is located in Lake Junaluska, North Carolina. This item can be shipped worldwide.